Andrus Ansip, Europe's Vice-President for the Digital Single Market, wants to abolish geoblocking. Restricting user access to content based on their location, which Netflix, YouTube and others do, is discrimination, he says. "I want to pay – but I am not allowed to. I lose out, they lose out," Ansip notes. 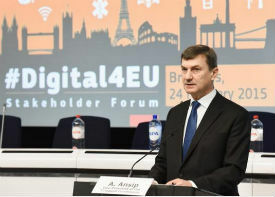 Geo-blocking regional blockades is a thorn in the side of Andrus Ansip, Vice-President for the Digital Single Market in the European Commission. In a speech this week he explained why these roadblocks should be abolished. The Commissioner is targeting an issue that lies at the core of the movie and TV industries, who license content per location. Ansip specifically mentions BBC’s iPlayer, but other services including YouTube, Amazon and Netflix have the same restrictions. The geoblocking restrictions are demanded by content creators, who want to sell the streaming rights on a regional basis. To enforce these licenses, users from outside of the designated countries are blocked. The Commissioner believes that this is an outdated concept which he likens to discrimination. If people want to pay for content, they should be able to, regardless of where they live. “How can this be a good thing? We put up with the situation because there is not much alternative. Now it is time to do something about it,” he added. The artificial restrictions are not a market issue according to the Commissioner, but a matter of rights. These rights should be enjoyed equally and not just by the happy few who happen to live in a ‘licensed’ country. “There should be no exceptions. Everyone should be treated the same. This is a key principle that underpins everything we want to achieve,” Ansip said.